The “disrupt-or-be-disrupted” mantra is real. Yet, many companies struggle to think about disruption and disruptors in a structured way. 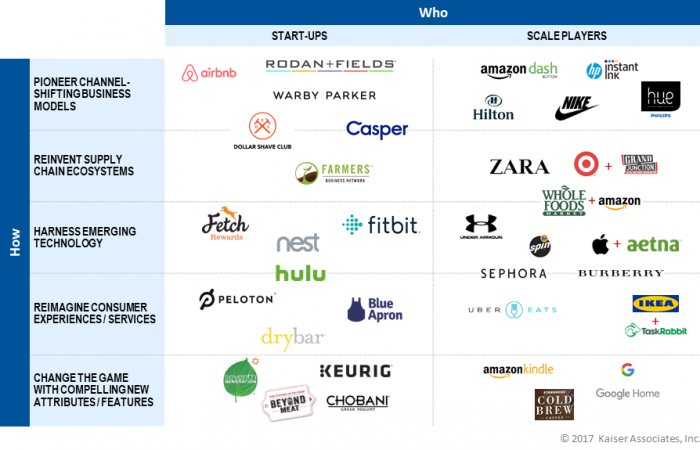 Through our extensive experience supporting large CPGs, emerging brands, and PE firms/portfolio companies, we have identified 5 disruption plays used by start-ups and scale players alike. Who is working to disrupt you, and how? At Kaiser, we are passionate about helping executives successfully navigate disruption; identifying and delivering disruptive growth is a core Kaiser capability. We regularly work at the intersections of new categories, channels, and technologies, partnering with our clients to disrupt / explode these intersections. Sometimes we are engaged to drive Proactive Disruption – for a large CPG or PE portfolio company looking to be a disruptor and do something bold and game-changing in core or adjacent categories. 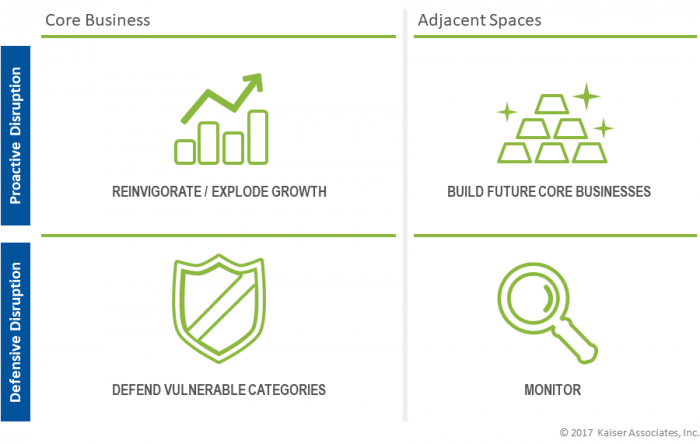 Other times, we are engaged in a Defensive Disruption situation, where an incumbent wants to identify and vet emerging disruptors and develop a strategic answer (build, buy, partner) while they still have the chance. Are you thinking about Disruption proactively and defensively? Kaiser’s unparalleled 360° research across the value chain generates fresh, granular, and distinctive insights. With this approach, Kaiser is able to pinpoint where, when, why, and how to disrupt in order to maximize value creation. Kaiser consistently identifies disruptive growth opportunities (and risks) that other consulting partners can miss – allowing for earlier identification of opportunities / acquisition of early stage start-ups.